Things seem to be going well so far on working towards making my Tome Baker season seventeen Frock Coat. So far I have traced the Romana Pink Frock Coat and cribbed the individual pattern shapes. My next step is to unite them into a single block from which I can work. My college tutor had been a little skeptical of how well I could trace the pattern from a made-up garment, but when she saw what I had produced, she was impressed. The proof though would be seeing how well they matched up when drawn as the block. 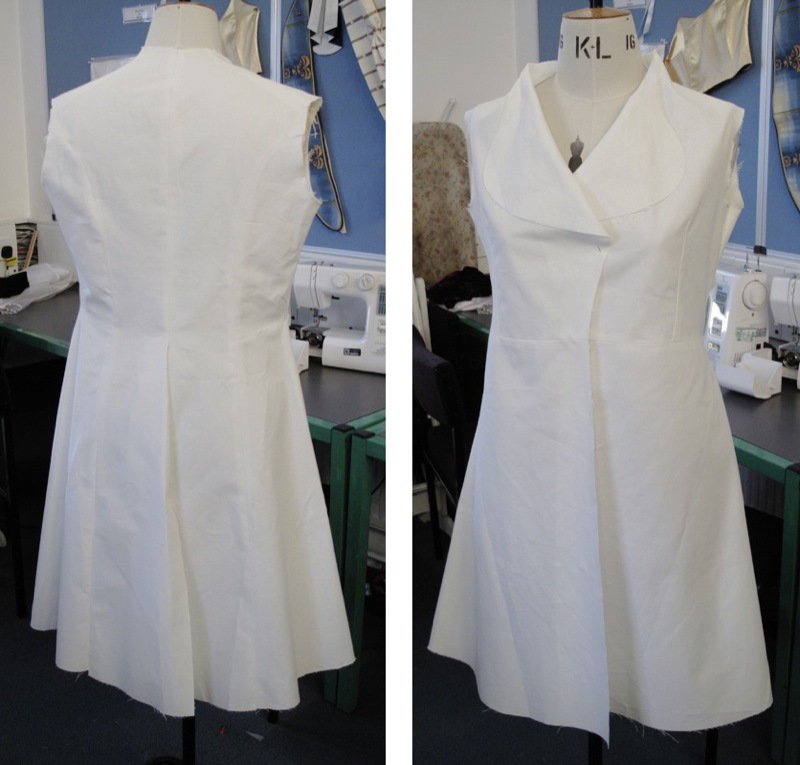 Remembering how I drew my Lounge Jacket Block, I started with the back and worked my way around the body to the front, before adding the skirt panels below. To my satisfaction they came together, forgive the pun, seamlessly, and made for a very unified and conjoined block. The parts of the pattern I concentrated on were the sleeve opening, the waist and hemline. Keeping these in alignment is important. The finished result certainly looked and felt right (see left). The benefit of working in a united block is it’s ability to very quickly translate and verify measurements from one part of the pattern to another. If I was to grade each part individually I would not know if I had matched the length of the joining seams until I cut it in calico and started stitching it together, by which time it would be too difficult to back track and correct any inaccuracies. My next task is to enlarge this pattern block in such a way it fits me. This is not just a simple job of adding an inch to every dimension. The human body grows bigger in different ways in different parts of the body. It is only once you start making fitted garments on a regular basis that you become aware of how this happens. To learn about grading, I bought myself a really useful and helpful book on the subject. Grading For The Fashion Industry gives detailed instructions for a wide variety of specific garments for both men, women and children (see right). There seem to be two different techniques to pattern grading: firstly to slice the pattern through imaginary horizontal and vertical lines, then open them out by set amounts and re-trace the resulting shape; or secondly to find a focal point of the existing pattern shape (not necessarily the centre) and project lines out from here, passing through the corners of the pattern, thus projecting a revised size. My tutor has advised me to do the enlargement in two steps: first time to get it up to nearer my size; then second time to adjust it to fit while making the final size corrections. I guess it’s like playing golf – a hole in one would be nice, but it’s better to aim a bit shorter and land safely on the green than go too wide and land in the water or the bunker and struggle to get back on track. 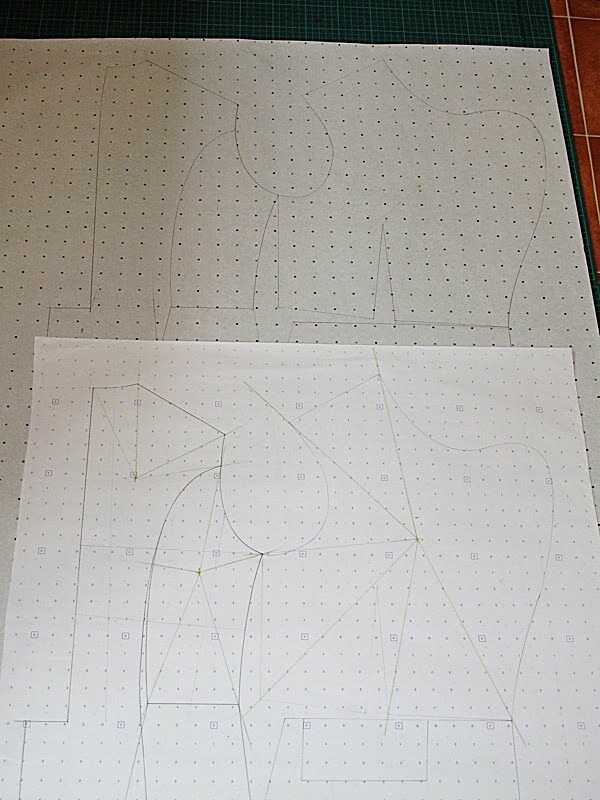 I am going to do the first round at home using focal points, and the second in class using the slicing method. It difficult to put into words how I went about my first stage of enlargement, but I basically re-traced each pattern piece, keeping it in the block layout, but expanding them as I went. You can see the focal points I choose for each panel in the original block (see left, below in picture) compared to the enlarged block (see left, top in picture). This revised block kept its form as before, but was a good 10 to 15% larger. From here I traced off each panel onto tissue paper, separating them out this time so they did not overlap, and adding a 1cm seam allowance all round at the same time (see right). Finally, I just need to do a practical test to ‘prove’ the pattern works, and so I cut these enlarged, seam allowance-inclusive panel into calico and quickly stitch them together. This happened in double quick time as every seamed edge matched it counterpart perfectly - result! Trying it on it is still way too small for me, but it now fit on my mannequin - just about. I took this ‘homework’ to my tutor this week to see what she thought of it before proceeding to the next stage, which will hopefully arrive at a pattern that will now fit me, fingers crossed! At college they have some female mannequins to set sizes, and my calico test nicely fitted the size 16 (see below). So at least I know when I am out now. You do such fantastic work. I am really looking forward to seeing this completed. 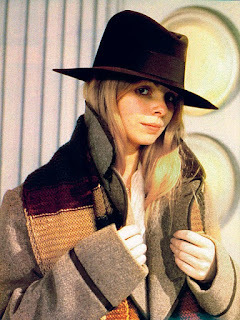 Invaluable info here, especially since I've been trying to make the Romana coat for a long, embarrassing time now. Though I am curious, not one to know anything about making garments etc, is the extracting the panels away from each other in the original block important in the process? Or is that just how it goes to save space on paper? How's work going on the Tom Baker, Season 17 frock coat. Very interested in this garment. Thanks.